This work has been withdrawn from the Catalogue Raisonné. The photo above is of the reproduction in the book, Phaethon Son of Apollo (See below.) not of the etching itself. Dimensions: 2 7/8 x 7 1/2 in. *Catalogue number: One proof of Fig. 1 above formerly appeared in this catalogue as entry #68, and was classified as an etching from the collection of the Baltimore Museum of Art (BMA). Subsequently it has been reclassified by BMA as a relief print reproduced from a pen and ink drawing also in the collection of the BMA (1950.12.18) by means of an electrotype process. Therefore this work has been withdrawn from the catalogue raisonné of Fiene's prints, being a photomechanical reproduction of a drawing and not an original print. Furthermore there is, until further notice, no longer an entry bearing the number "68" in the catalogue raisonné itself. 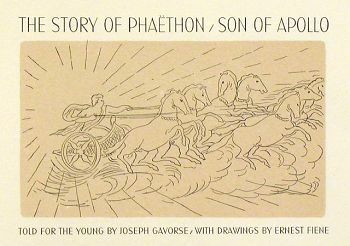 **Book Illustration: This image appears on page 15 of Phaethon Son of Apollo, by Joseph Gavorse, illustrated with eleven "drawings" by Ernest Fiene and published by the Society of American Bibliophiles in 1932, in an edition of 300. Annotations: The BMA trial proof of the image, signed and annotated by the artist, appears on a page with letter press text.